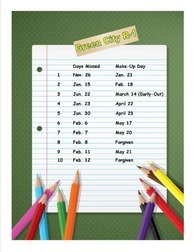 With only about four weeks left, our school year is rapidly coming to a close! The really cold days are finally over, and we are having more outdoor activities. Some days are still pretty chilly though, especially in the morning. Please dress your kids in layers, so they can be the most comfortable during their day. And, don’t forget to have them wear proper footwear on PE days. The PSP dental crew came back this semester and applied cavity-fighting fluoride varnish to 102 of our elementary students. They will return again in the fall for next year’s FREE dental exam and fluoride . . .
Second semester has been a lot of fun for the 4th graders. 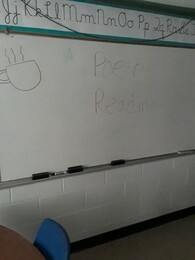 We did a poetry reading where we read poetry that students wrote and enjoyed some hot chocolate during the readings. Students also got their desks covered in shaving cream and were able to review for a math test by writing their answers in the shaving cream. The 4th grade group continues to have fun with reading activities about the book Bunnicula which is currently being read as well as working on a Social Studies group project about Native Americans. While we have fun we're also working extremely hard to prepare for the MAP test which will be taken in just a few . . .
Its hard to believe that we only have about a month of school left. It seems like each year goes faster and faster. With that being said track season is in full swing and so far we have had great weather for our meets. After today we will have went to 9 of our scheduled 14 meets between Jr. High and high school. I have 11 Jr. High boys and 13 Varsity boys that have done a tremendous job so far. We won the Atlanta Jr. High track meet and came close to winning the Atlanta Varsity track meet but fell a little short. With conflicts with other activities going on we only had 7 of . . . The Green City R-1 School’s Wellness Committee meets four times per year to ensure our school's wellness program continues to meet District requirements. These meetings are open to the general public and everyone is welcome to attend. 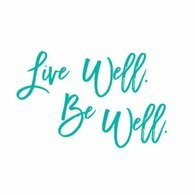 The Wellness Committee includes school administration, coaches, dietary, teachers, parents, district citizens, and students. We currently have two high school student representatives on the committee. Unfortunately, both students are graduating this year. We are seeking at least two replacement students to join our Wellness . . .
We are in the home stretch of the year and there is a lot going on building wide. Please remember if students are attending a baseball game or school activity that all elementary students must attend with someone 18 or older. Also with the weather warming up it is nice outside, and we like to have students outside for recess. Students need to dress for the weather and bring a jacket or coat as needed. Also remember that students must follow the school dress code for clothing. Please see below for a copy of the dress code. Upcoming Events: Tuesday, April 2nd Band . . . Thank you for your flexibility during this crazy winter weather. Please see the graphic below for the days that school will be in session to make up for the days we have missed due to weather. Mostly clear, with a low around 51. South wind around 7 mph. Sunny, with a high near 80. South wind 8 to 18 mph, with gusts as high as 36 mph. Mostly cloudy, with a low around 59. South southeast wind 13 to 15 mph, with gusts as high as 24 mph.